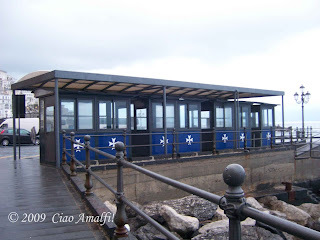 I was greeted in Amalfi the other evening by a row of new ticket booths for boat tours and the boats that run between the cities on the Amalfi Coast and to the islands. While they are certainly all fancy and orderly, I really don’t care for them at all. Where the old wooden booths with their different shapes and colorful posters had character, this standardized row of booths has about as much character as a row of canned vegetables in the supermercato. They could put twenty Amalfi crosses on each one and I still wouldn’t be impressed. They also block a nice view of the port in their new location. 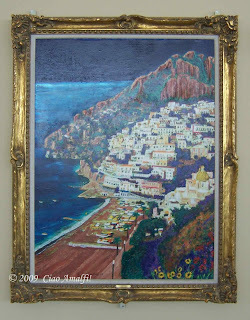 Can you just imagine sitting inside one of those glass booths on a good and hot summer day in Amalfi? Toasty. I fear the little windows they are equipped with just aren’t going to cut it. While I am generally positive about improvements, such as the new sign in Piazza Flavio Gioia that says how many parking spots are available down at the end of the port (genius! ), these new booths served as a reminder for me that not all progress is improvement. I guess I have Sorrento on the mind these days, and I have been thinking back to my last visit there on a beautiful day at the end of January. I had walked by the Duomo of Sorrento on previous visits, but hadn’t been there while the church was open. Walking into a church I haven’t visited before is by far one of my favorite experiences in Italy. Sometimes beyond the starkest facade you will discover a church that missed the Baroque redecoration craze and that still offers us a taste of its medieval splendor. Or perhaps that plain facade is hiding an exquisite and well preserved interior from the 17th or 18th centuries. You just never know! 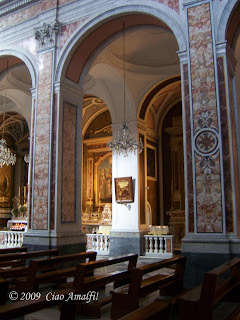 When I walked into the Duomo of San Filippo and San Giacomo in Sorrento, I was certainly surprised! 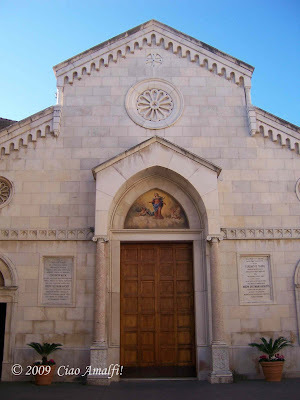 Its simple and bright white facade, rebuilt in the early 20th century with Romanesque hints, reveals little about what you will find inside. 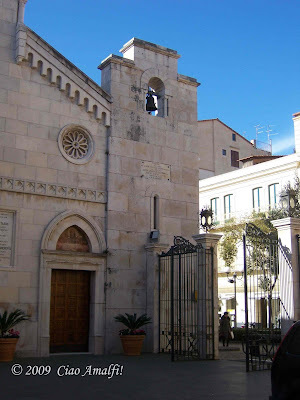 While the church may have had ancient origins, it was largely rebuilt in the 1400s. Once inside, you will find a wealth of art on display throughout the elegant and well-preserved marble interior. Don’t miss the marble Bishop’s throne carved in 1573. What impressed me the most about the Duomo of Sorrento is the incredible intarsio, or inlaid wood, pieces you can find throughout the interior. Sorrento has been known for fine intarsio work since the 18th century, and the Duomo is a veritable museum of masterpieces. 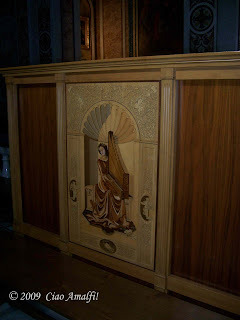 Wander up and down the side aisles and you can find pictures, the stations of the cross, large doorways, a beautiful podium, and wooden choir stalls decorated with elaborate and finely detailed intarsio. 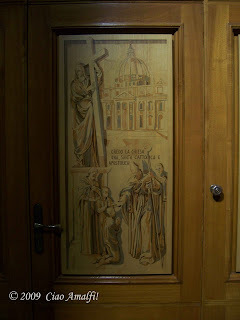 It was such a pleasure for me to see the work of the local artisans on display throughout the Duomo. For me, churches are like picture books of their surrounding communities. The Duomo of Sorrento is a wonderful example of the continuation of the historical connection between artisans and the church. Images simply don’t do justice to the beauty of the intarsio work. While you will find examples on display in workshops and stores around Sorrento, this is one of the best stops to see how glorious and impressive it can be. Next time you visit Sorrento, try to stop by the Duomo and see if it surprises you. I had somehow convinced myself that my flight for Rome left at 2:30pm. 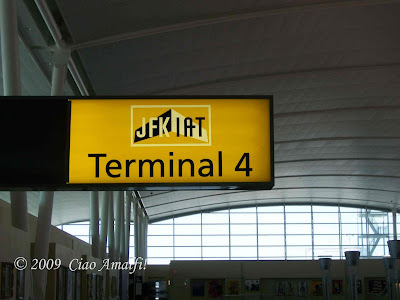 When I got off the plane from Minneapolis last Friday and saw on the flight departure screens that my flight to Rome left at 4:30pm, I very quickly realized my already long 4 hour layover had just become a 6 hour layover. Uffa! Perhaps it was better I had convinced myself otherwise. 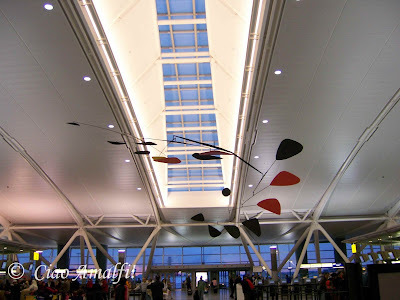 Rather than sitting and staring or reading, which is what I knew I would be doing on the 9 hour flight, I wandered around and took in the artistic and architectural sites at the JFK airport. There must be something to see, right? After all that walking I was ready for a nice cup of tea. Certainly not all airports are as interesting as JFK, but many have terminals and expansions designed by top architects around the world. Next time you have a long layover at an airport, don’t forget to explore the art and architecture of your surroundings. It sure beats eating the generally overpriced and unpleasant airport food! Sunday Shout-out: Welcome to Sorrento Leanne! After a perfectly uneventful day of travel, I am very happily back home on the Amalfi Coast. 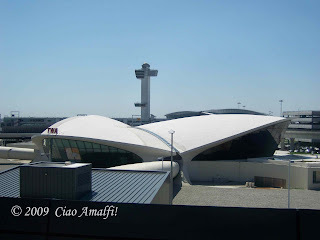 Both of my flights left early, I had time to go look at the Saarinen TWA Flight Center (exterior only), had lots of space on the JFK to Roma flight, my mound of luggage arrived safely, and we hit no traffic at all on the drive home. 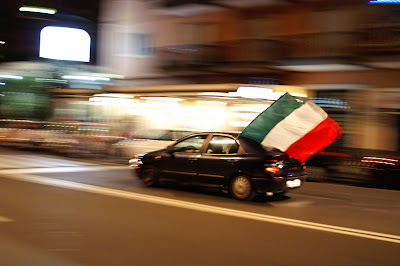 I was a bit worried about traffic since yesterday was La Festa della Liberazione, which is an important national holiday here in recognition of April 25, 1945 when Allied troops finally were able to liberate Italy during World War II. Apparently it is one of the worst traffic days of the year, especially here on the Coast, but I was lucky and got in early in the morning and was home by 11am. I unpacked, enjoyed the sun by cleaning the garden and cutting the grass (yes, I actually did do that after an international flight . . . it is amazing what the sun can inspire! ), made an excellent dish of pasta con salsicce (pasta with sausage) for dinner, and enjoyed the evening with my boyfriend. Always good to be home! It is definitely la primavera here! The mountainsides are green now and flowers are in bloom everywhere. It is really the perfect time to come to the Amalfi Coast! That being said, I would like to give a warm welcome to the area to Leanne, writer of the fun blog From Australia to Italy, who has just relocated to the beautiful city of Sorrento. I have enjoyed reading Leanne’s blog for awhile now, and I am looking forward to meeting her someday soon here on the Amalfi Coast. While Sorrento is only about an hour drive away, it is a city I have not explored in depth yet. I would likely head over there more often if I didn’t have my current predicament with driving. 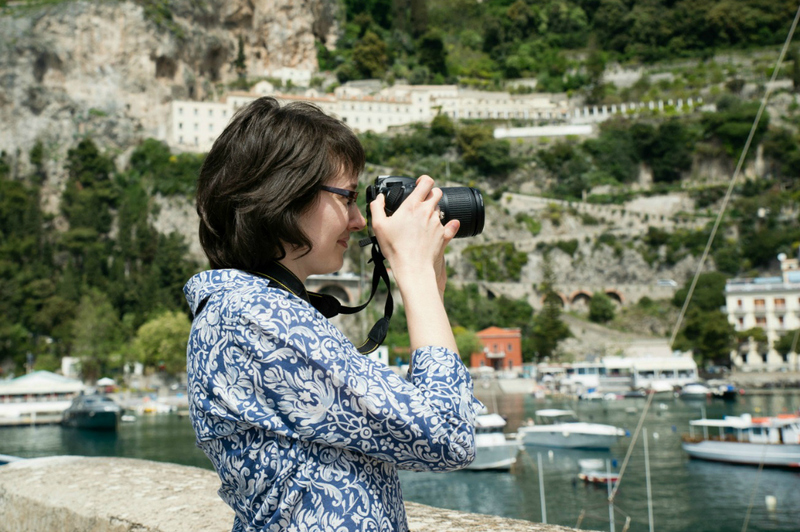 Leanne was worried about driving the Amalfi Coast road, which she has to do often for work, but it turns out she is a natural! Head on over to From Australia to Italy to read about Leanne’s driving adventures and first taste of Sorrento. I am anxious to see the city through her eyes, and to have a great reason to head over and get to know Sorrento myself. Bright and early Friday morning I start another long journey back to home on the Amalfi Coast. I have a layover at JFK, which I have to say is one of my favorite airports. 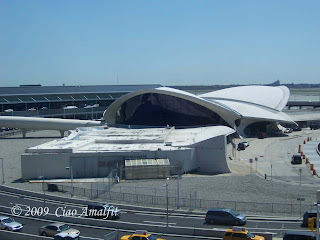 It is home to Eero Saarinen’s TWA Flight Center (Terminal 5), which was completed in 1962, and many great works of art. The International Terminal has a lovely mobile by Alexander Calder that I love seeing as I check in at the Eurofly desk. I will be back soon posting my next Sunday Shout-out from (hopefully) sunny Italy! Ciao ciao!